Twin suicide bomb attacks on the Pakistani city of Lahore have killed 45 people and injured around 100. Bombers targeted military vehicles as they passed through a crowded area and at least nine soldiers are among the dead, officials say. Several more explosions were heard in the city later on Friday, but there were no reports of serious injuries. The attacks follow threats by Taliban militants to send out thousands of suicide bombers. The earlier explosions took place near the RA Bazaar, in a busy residential and shopping area where army and security agencies have facilities. No group said they had carried out the bombings. Pakistani media suggest that at least some of the blasts heard later on Friday were caused by firecrackers. One unconfirmed report spoke of several injuries. These latest attacks are the first in this politically important city since December. It is the capital of Pakistan's most populous province - a barometer of its stability. One possible reason for this sudden escalation could be the recent death of Qari Zafar, a top leader of the so-called Punjabi Taliban, in a US drone strike in the north-west. But it may also be simply a waxing and waning of pressure by the militants to wear down the government's resolve. Lahore is the only provincial capital which is still considered relatively safe. Other cities have borne the brunt of incessant militant attacks. Officials said the earlier blasts had occurred within 15 to 20 seconds of each other. There are conflicting reports about whether the two bombers rode motorcycles or were on foot. Police official Chaudhry Mohammad Shafiq said the severed heads of both attackers had been found. 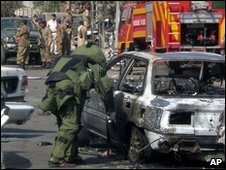 Suicide bombers often strap explosives to their bodies and are decapitated when they detonate. An eyewitness, Mohammad Nadeem, said he had been praying in a mosque when he heard the first blast and rushed out only to hear a second. "The second blast took place very near a military vehicle," Mr Nadeem, his clothes stained with blood, told AFP news agency. "I sensed real danger and started running. There were scenes of destruction in nearby restaurants and shops. "There were broken chairs and tables and other items lying everywhere on the ground." Another eyewitness, Afzal Awan, said he had seen wounded people with limbs missing lying in pools of blood. "I saw smoke rising everywhere," he told reporters. "A lot of people were crying." On Monday Taliban militants destroyed a building used by intelligence services in Lahore, killing 13 people. After that attack, the Pakistani Taliban promised to unleash up to 3,000 suicide bombers across the country unless Pakistan's army stopped its operations against the militant group and US drone strikes ended. Pakistan has been fighting insurgents in the volatile tribal areas bordering Afghanistan. The military recently stepped up operations against the Taliban leadership, arresting the military commander of the Afghan Taliban, Mullah Abdul Ghani Baradar, who was hiding in the southern city of Karachi. A number of other top figures in the Afghan Taliban are also reported to have been arrested across Pakistan over the last few weeks. In the last six months, hundreds of civilians have been killed in militant attacks across the country. The BBC's Aleem Maqbool in Islamabad says there are no signs the violence is coming to an end. Last October simultaneous assaults on three security buildings across Lahore killed 38 people. In December, two bomb blasts at a market in the city killed 48 and injured more than 100.